Mephistopheles’ pours ‘damn black’ with little mocha head. What little head there was dissipated rather quickly. On the nose, I’m hit with dark chocolate, roasted malts, a slight smokiness, and of course a hint of alcohol. The taste is a creamy chocolate eruption. While still somewhat chilled, the alcohol heat seems centered on the tip of the tongue. As it warms, the heat turns up big time. There’s a nice dark chocolate and coffee bitterness that lingers. As for mouthfeel, it’s heavy in body, oily, and completely coats the mouth. A little under-carbonated, but that’s to be expected. 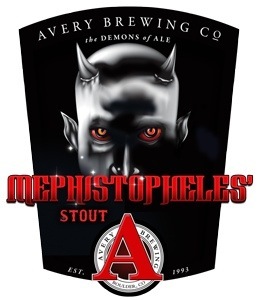 This is a big beer, and Mephistopheles’ lets you know it. I thought this was a very fitting Beer of the Week, as Avery’s 20th Anniversary Party is just over one week away!